6 detainees will soon have finished their trial process, they are waiting to find out the results of the trial and how long their sentences will be. 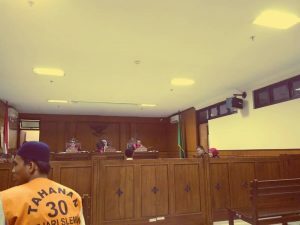 However there are 4 prisoners who still remain in Cebongan Prison (including Ucil) and 1 other prisoner who is still being held in Sleman Police Station, it is still unclear what is happening with their trial process. On Tuesday, August 14th ,2018, the trial for comrades O and M began, while on Thursday, August 16th, 2018, the trials began for comrades MI, MEA, AMA, and ZW. As for Brian Valentina (Ucil) , his trial will be held on Tuesday, August 21st, 2018. Let’s express our solidarity by attending the trial every Tuesday and Thursday at 10AM in the Sleman District Court or by visiting the comrades in Cebongan Prisonand Sleman Police Station who do not have clear information yet about their trial process.